Table Tents – Table tents, or tent cards, are commonly made of coated card stock, and are often seen in restaurants promoting everything from frozen turtle pie to umbrella drinks. While paper gets the job done, plastic holds up better to ketchup splatter, spilled drinks, teething babies, and overly zealous bus boys. Parking Permits – Have you ever noticed that parking permits — the kind you’re supposed to jam onto your rearview mirror — are always made of the thinest, cheapest card stock available? Inevitably, they tear and bend as drivers force them into place trying to make their appointment. These are high-use items, like handicap placards, which are made of plastic. Hmm? Loyalty & Gift Cards – Ditch those paper punch cards! For $10-$12, a customer can buy a matching hole punch, and they’re on their way to their next free hair cut, taco combo, or whatever it is you’re selling. Plastic loyalty cards are more professional, less vulnerable to fraud, and re-usable. Many computer-based POS systems will offer a loyalty/gift card component. If they don’t, we can help you out. Here’s a tip: you don’t have to purchase loyalty or gift cards from your POS provider. You can save money by buying them directly from the supplier. Fundraising Cards – If you’re like me, you’re a sucker for a teenager willing to walk door to door selling fundraising cards. I always buy them, and they always get mangled in my glove box or wallet. That’s because they’re often made of paper. A more durable plastic card will last all year, and will drive more traffic to the merchant, making it easier to get them to sign up the next time. Membership Cards – If you’re printing your membership cards on paper, stop. 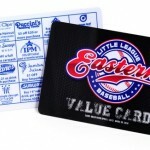 Plastic membership cards will outlast paper, and provide a lot more credibility to your organization. You can invest in a single-sided thermal printer to print member names and numbers onto your preprinted plastic cards, or use a fulfillment service.